NYFF 2016: "The Lost City of Z"
In recent years, film festivals’ insistence on world premieres has deformed the programming at many festivals, as well as proving an annoying obstacle to filmmakers who want their work seen as widely as possible. If a film is outstanding, why should it matter if it has played one or more other festivals? Fortunately, the New York Film Festival has maintained its old-school ways in not giving into the mania for exclusiveness. Generally, there are only three slots in the festival’s Main Slate that always contain premieres: Opening Night, the Centerpiece and Closing Night. This year, Ava Duvernay’s “13th” became the first documentary to occupy the Opening Night slot, and Mike Mills’ well-received “20th Century Women” stimulated rumors that Annette Bening will be a leading Oscar candidate for her role in the Centerpiece entry. Closing Night honors, meanwhile, were bestowed on “The Lost City of Z,” a dark Amazonian adventure saga by James Gray. Gray is a New York City director with six features to his credit, but only recently has he been considered by the powers-that-be at Lincoln Center to be a New York Film Festival-worthy director, and I would venture there’s a good reason for that ascent: his work has gotten steadily more distinctive and accomplished over the years. While his fourth outing, “Two Lovers,” perhaps qualifies as his first real tour de force, his fifth, “The Immigrant,” proved to be a hugely ambitious and nervy period drama that divided critics at both Cannes and New York. That kind of controversy is often a healthy thing at festivals, and to my mind, “The Immigrant” eminently deserved its place in the 2014 Main Slate. “The Lost City of Z” is another beautifully wrought drama that takes place in the early 20th century, but it’s also the first film in which Gray takes leave of New York, and indeed of the U.S. Based on a highly acclaimed non-fiction book by David Grann, it traces the arduous search of a British officer named Percy Fawcett for the ruins of a vast pre-Columbian city that he’s convinced lie deep in the Amazon forest. This, of course, is an El Dorado quest like many such over the past five centuries, while cinematically it recalls Werner Herzog’s “Aguirre, the Wrath of God” and “Fitzcarraldo.” As charismatically played by Charlie Hunnam, though, Fawcett is just the opposite of a Klaus Kinski-like raver: his obsession is determined but also quiet, buttoned-down, consummately British. When we first see him, stationed in Ireland in 1905, Gray establishes that Fawcett’s an excellent horseman and shot but also a man with a grudge against the world. As one of his superiors puts it, he suffers “from an unfortunate choice of ancestry.” His father was a drunk who besmirched the family name. Though Gray doesn’t overstress it, redeeming that name seems to be Fawcett’s main motivation for accepting an assignment from the Royal Geographic Society to go to Amazon and head off war between Brazil and Bolivia by ascertaining their true borders. He’s given a taciturn, bibulous subordinate named Costin (Robert Pattinson, almost unrecognizable in a bushy beard). The jungles the men plunge into are as forboding as dense brush, heat, insects, poisonous snakes and hostile natives can make them. Fawcett and Costin assemble a small team and often travel up the Amazon on a raft that’s open to all sorts of hazards. Somehow they manage to make progress on their surveying mission, but its importance begins to recede when Fawcett finds some sophisticated pottery fragments and hears stories of a now-long-gone civilization that he dubs the Lost City of Z. Convinced that he’s stumbled onto a major archeological discovery, he returns to London to announce the news and gather funds for a new expedition. But at the Royal Geographic Society he meets scorn and incredulity—a reaction that feels like it may be somewhat overstated given that this was the era when Hiram Bingham found Macchu Pichu, proof positive that there were amazing discoveries still to be made. Fawcett also gets some pushback at home from his wife Nina (Sienna Miller), who isn’t thrilled at the prospect of raising their three kids alone while hubby ventures abroad for years at a time. The film shows that he made two more expeditions to South America, separated by several years and his valorous service on the Western Front in World War I. 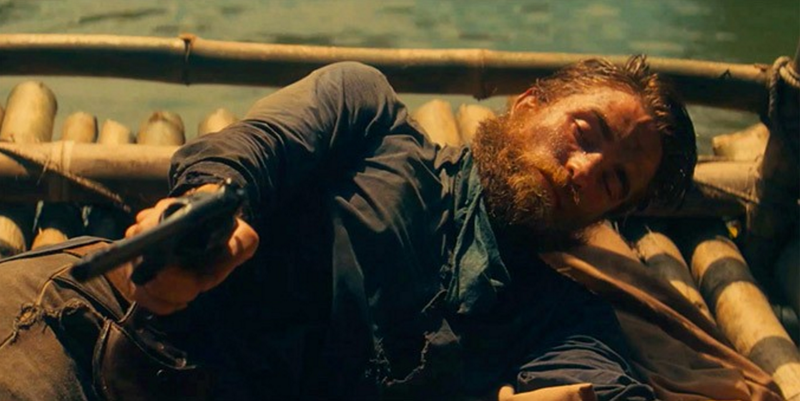 The story’s central issue isn’t whether the Lost City of Z exists. Indeed, that question increasingly seems to pale against Fawcett’s steely, unwavering determination to keep pushing forward at all costs. Redeeming the family name likewise falls by the wayside as a factor. It’s as if his real quest is not for honor, fame, fortune or even the Lost City but for some mystical identification with his destiny as one who seeks, no matter what. Compared to a hyperactive, effects-driven perils-of-the-wild yarn like “The Revenant,” Gray’s film aims for more elusive and rarefied cinematic targets. Solemn and grave, it unfolds methodically, listening and observing rather than seeking propulsion or even revelation. If it’s finally a less startling and original feat than “The Immigrant,” that may be partly because it’s tied to historical reality, and one that’s not native for Gray. His script from Grann’s book is straightforward and effective, but without real distinction or any notable confidence in its British idioms. Next Article: Personal Narratives Fuel this Year's Best Actress Race Previous Article: CIFF 2016: "Paterson"